A knowledge base is an invaluable resource for your customers. It's the self-service component of your support offering that enables customers to solve their own problems. And the best part is ticket deflection. Customers who can find answers for themselves should file fewer tickets. Find common issues. "Users always struggle with X." Find frequently asked questions (FAQs). "Users always ask Y." Find known issues that impact a lot of customers. "Your product does not work in IE 7." Find time-consuming issues. "It takes 30 minutes to set up." The best way to do this is to analyze your tickets. They are the best record of your customer issues and pain points. But don't forget about other resources that might also help you pinpoint issues you should document in your knowledge base, including macros, tags, existing content, and consult your community. Note: If you're on Guide Enterprise, consider signing up for the Content Cues early access program. Content Cues uses machine learning to group ticket clusters around issues that lack knowledge base content or need content improvements. When you want to start a knowledge base, it's essential to mine your tickets for common issues and customer pain points. This can be a fairly manual process. Think about the data you're capturing in tickets and how you can use it to determine where you need content. Categorize your tickets. How you categorize your tickets depends on the information you're collecting in tickets. Ideally, you'll want to categorize by issue, using a custom "about" field. Then you can build an Insights report to see what you major ticket categories and issues are. Drill-down into ticket groupings to find common issues. After you organize your tickets into categories, you'll want to create a view to dig in to the categories with the most tickets and find the common, high frequency issues. Determine what to document. Keep a tracking document where you can record issues you find, then determine what you want to document and set priorities for creating the content. The first step in analyzing ticket data to determine content needs for your KB is to categorize your tickets. Your ticket categories depend on the data you're collecting in your tickets. Take a look at the custom fields you've set up to collect extra information. Hopefully you're capturing some data about your customers, product, or issues that will help you. The best case scenario is that you have data about the major issue in each ticket so that you can easily categorize tickets according to issue. For example, if you have multiple products (Game ABC, Game XYZ, and so on) or different user segments (novice, professional, developer, and so on), do you have a custom field for those items? Or do you have a custom field for selecting the feature related to the problem, such as "Drawing tool" or "Exporting?" At Zendesk, we have a custom field called About that contains common ticket topics like "Multibranding" or "Salesforce." Agents use this field to indicate the issue for each ticket. We also have a custom field called Handle Time to track the amount of time an agent spends handling a ticket. By comparing About and Handle Time, we identify topics that require a lot of time for our agents to handle. Then we can drill down to find common issues that we can document in our KB. If you are not currently capturing data that you can use to categorize tickets, set up a custom field where agents can indicate the issue for each ticket (see Adding custom fields to your tickets and support request forms). Then, on Professional or Enterprise, you can build an Insights report for your ticket categories based on a custom multi-select "about" field using ticket tags. After you categorize your tickets, you can drill-down into each major category to find specific, common issues. To do this, you can create a view of each category. If you have a lot of categories, you might want to start with the ones with the most tickets. You might be able to find recurring issues by scanning ticket subject lines, but you'll probably have to dig in and read through tickets to pinpoint specifics. This will be a manual process. Click the Admin icon ( ) in the sidebar, then select Views. Zendesk Classic: Select Manage > Views. 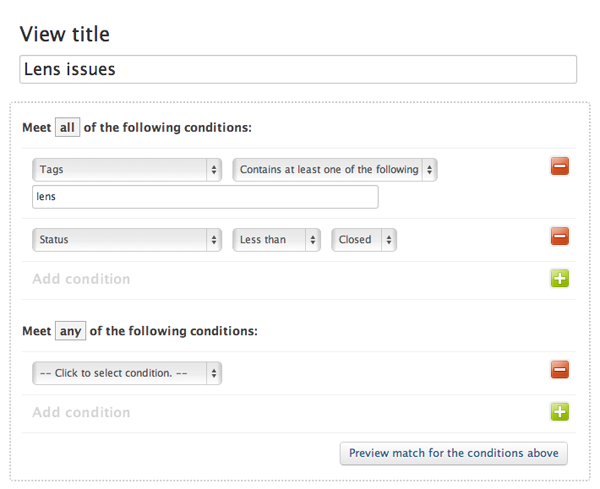 In Meet all of the following conditions, add conditions to show tickets tagged with a specific issue. Select Tags and contains at least one of the following, then enter one of the tags associated with an issue in your About field. Click the Plus (+) to add another condition, then select Status and less than Closed. Note: If you also want to review closed tickets, you can create another view. There is no way to see all tickets of any status in the same view. Select Preview match for the conditions above to test your conditions. Set Formatting options (see Setting formatting options). In the Available for section, select Me only to make this a personal view. Now you are ready to dig in and find specific issues in this grouping that might need to be documented in your KB. Establish a system for tracking the recurring issues you find during your ticket analysis. A google doc or a spreadsheet that you share with others who might helping with the research, will probably work well. Later, you can use this document as a tracking sheet that you can update as you add items to your knowledge base. And you can also use it to make assignments where content needs to be developed. As you drill-down into tickets in the view for a particular issue, you might find that some issues you thought were common are not actually common enough to document. And maybe some recurring issues don't lend themselves to documentation because there too many variables in customer's environment. Your spreadsheet will evolve throughout your analysis phase as you add and remove issues as needed. Your tickets will probably be your best resource for finding common customer issues and determining what to put in your knowledge base. But don't overlook other valuable resources that might not take as much time and analysis. Here are some things to consider. If you use macros for common responses to tickets, you might want to take a look at your most used macros. You will probably find some common customer pain points in those macros. And you might be able to reduce tickets, and specifically tickets that get these popular macros, if you document the topics covered in those macros in your knowledge base. Click the Admin icon ( ), then select Macros. Zendesk Classic: Select Manage > Macros. Select Sorted by usage over the last 7 days (or over the last 24 hours, if you prefer). Review the list of most used macros to find issues. The tags on tickets can also help you categorize tickets and find common issues. We've already talked about analyzing tags set by drop-down custom fields. You can also use other tags to help pinpoint common issues. Take a look at your tag cloud to see the 100 tags that have been most applied to tickets in the last 30 days. This might give you some ideas about different groupings or issues where you can drill-down. Or, better yet, if you have system for manually tagging items that need documentation, then you can review those to find important items to document. But that's probably something you will start doing, but haven't been doing yet! At Zendesk, when we set up our internal knowledge base, we relied on the tags set by our custom fields. But we plan to start manually a tag for doc_needed as another way to surface topics that need to be documented. Click the Admin icon ( ) in the sidebar, then select Tags. Zendesk Classic: Select the Manage menu, then select Tags. You should not overlook any existing content. This can be another source for determining issues and seeding your knowledge base. And in most cases, it's ready-made content that can go directly in the knowledge base with little or no editing. Informal documentation Support agents usually have "cheatsheets" or informal docs to help them remember common issues and workaorunds. They might be in the form of Word docs or Google docs. Sometimes they are even shared or part of an informal documentation process. Be sure to ask your agents about these docs, if you don't already know about them. Macros Any macros that cover known issues and workarounds can also be a good resource. Leverage that content to create knowledge base topics. In most cases it's an easy win. Help content If you have Help documentation, review the topics that are covered and consider features that might cause problems or confusion for users. Proactively document those items. And don't forget to document known issues for features and common workaround or tricks. Be sure to listen to your internal community of agents and your external community of customers. It's a great way to directly learn about common customer issues and painpoints. Consult your agents. Your agents can probably tell you common issues or pain points, and exactly what the doc needs are. Be sure to meet with them to solicit their feedback on needed documentation. Ideally, this would become part of your regular process for knowledge management. Encourage your team to suggest new documents and, ideally, involve them in content creation as well. Find out what users are saying in the community. The community can be a good source of information for determining common issues and pain points. Check the most active threads for possible points of confusion. If customers are commenting a lot, it might a source of frustration that needs documentation. You can also search, if you have an idea of what to search for. Maybe you have an issue in mind and want to see how frequently customer discuss it in the community or maybe you want to validate findings from your ticket analysis (or check gut instinct!). Check social media. Go everywhere your customers are and find out what they are saying. You might hear about some common issues.